Lottoland's online lotto syndicates allow you to buy shares of hundreds of lotto number picks, dramatically boosting your chances of winning the jackpot. Available across all of our top jackpots, you get all the benefits of being part of a big syndicate, without any of the hassle! Read on to discover how to seriously increase your jackpot chances, and discover the full details on how our lottery syndicates work. At Lottoland we do lotteries different; more convenience, more choice, more ways to win and far bigger jackpots. Our new Lottoland Lottery Syndicates range was designed for the same reason, to create a simple-to-use feature that gives you even more ways to win. Instead of a traditional lottery syndicate, where you have the hassle of collecting everyone's money each week – not to mention the possibility of nasty disputes – Lottoland Syndicates are a much more streamlined click-and-pick affair. You can select from a number of different syndicate types, which are based on our flagship lotteries, such as EuroMillions and the Lotto, as well as America's MegaMillions and PowerBall. Each syndicate will have a different number of lines, or picks; the more lines there are, the higher your chances are of winning big. You can also choose how many shares you want. The number of shares corresponds with the percentage of the potential jackpot you would claim. Traditional lottery syndicate shares are based on how many people there are. With Lottoland Syndicates this varies. So, when you buy more shares you have the chance to win more, and share less. In other words, you get all the benefits of joining a syndicate, playing more numbers while spreading the cost being the most important ones, but in a faster, more convenient package where you get to choose how much you want to share! Lottoland syndicates are a brand new twist on traditional syndicates. Getting a group of friends and coworkers together and buying lots of tickets every week can be messy, frustrating and time consuming. So we created an easier way. 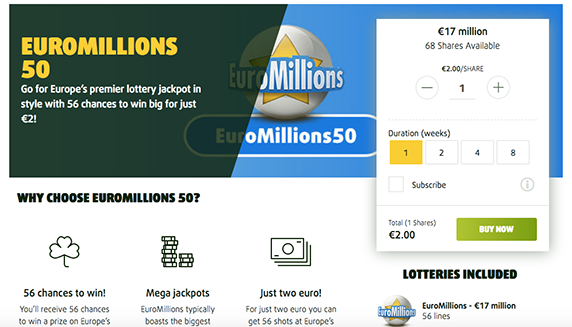 In the above screenshot we've got a syndicate product called EuroMillions 50. This game offers you 56 ways to win, in total. How does that work? Well, normally to play EuroMillions you only get to pick six numbers, plus your two lucky stars. But with Syndicates you're playing a "system entry" – essentially getting two extra numbers added into the mix in multiple combinations. In this case you get 56 possible combinations of numbers. So it's sort of like having 56 EuroMillions tickets, but way cheaper. Because if you were to walk into your local shop and buy 56 EuroMillions tickets it would set you back €140 – not cheap. So this is where the concept of Shares, not to mention our famous €2 EuroMillions price freeze, comes in handy. A single share in the above game costs just €2 – the same as we charge for a regular game of EuroMillions, but this time you get more chances to win. The tradeoff, of course, is that, since you’ve only got one share, any wins will be split between all the online syndicate members. In the case of the above example a maximum of 68 shares are available. 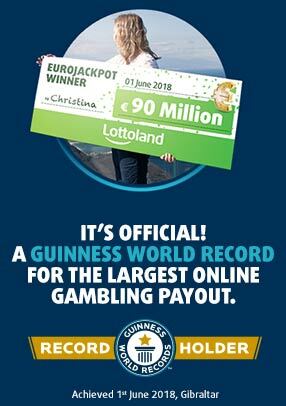 So, say the jackpot was €68 million and you won with a single share, you'd win a cool €1 million, having spent only €2. Different Syndicate products offer different lotteries, as well as different numbers of ways to win. For example, if you play the EuroMillions 1000 package you get up to 1,008 ways to win on EuroMillions! It's the same story with shares, some products have more shares – i.e. more people looking to share in the winnings – others less, so you get lots of flexibility. Do you want to get more ways to win and pay less, or pay a little extra to keep more for yourself? It's your call! Of course, just like a traditional syndicate, the idea is to play each week consistently, which is why we've also added some easy-to-use Subscription and Duration features so you can select how many weeks you want to play for and/or how the duration of your billing period. 1. Head to our special Syndicates section. 2. Locate the syndicate you wish to buy from the options provided. 3. Select how many shares you want. 4. Adjust your Duration / Subscription options if desired. 5. Finally, click on Buy Now button to proceed to the cart. Once you're happy with your selection just click the Confirm and proceed button to finalise the transaction. Did you know that one in every five lotto jackpot wins comes from a syndicate? 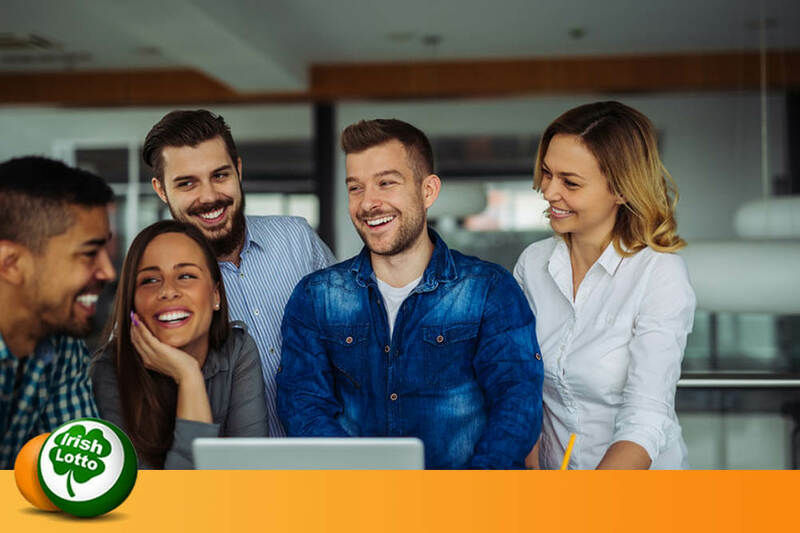 It's one of the reasons people love lottery syndicates – getting all your friends, family or work colleagues together for a shot at getting rich. But, let’s face it, they can be difficult to organise and it can be a pain making sure everyone pays up on time. Lottoland Online Syndicates remove all that inconvenience, providing you with all the benefits without any of the hassle. Plus, we offer you the chance to enter far more lotto lines in every jackpot, after all, how many office pools could club together to buy 1,008 tickets?! So, if you're tired of playing week after week and winning nothing make a change, supercharge your winning chances by joining one of our Syndicates. Prefer the old fashioned way? If you prefer the idea of having a good ole fashioned work syndicate for that added social factor we've got you covered too! Check out our article on how to start your own lottery syndicate which takes you through the process then, when you're done, don't forget to download our FREE lottery syndicate agreement form! Last, but definitely not least, don’t forget that if you follow Lottoland Ireland on Facebook you'll be able to enter our FREE TGIF Syndicate, where you can get a chance to share in a massive lottery jackpot every single Friday!